Contents. List of Contributors. Preface (E.E. Bittar and N. Bittar). The Lysosome: Its Role in the Biology of the Cell and Organism (B. Storrie). The Golgi Complex (A.M. Tartakoff and J.R. Turner). The Peroxisome (C. Masters and D. Crane). The Mitochondrion (D.D. Tyler). Lysosomal Storage Diseases (G.M.S. Mancini and F.W. Verheijen). Peroxisomal Disorders (R.J.A. Wanders and J.M. Tager). Molecules in Living Cells (D.S. Goodsell). Extracellular Matrix (D.W.L. Hukins, S.A. Weston, M.J. Humphries, and A.J. Freemont). Posttranslational Processing of Collagens (K.I. Kivinkko). Cellular and Molecular Aspects of Selected Collagen Diseases (R. Raghow). Index. This volume is in two parts. 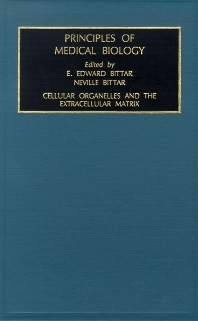 The first contains the remaining chapters on cellular organelles and several chapters relating to organelle disorders. An account of mitochondriopathis is given in the chapter on the mitochondrion rather than in a separate one. The subject matter of this part of the volume shows quite clearly that the interdisciplinary approach to the study of organelles has shed considerable light on the nature of the mechanisms underlying the etiology and pathobiology of many of these disorders. As an example, mutations in the genes encoding integral membrane proteins are found to lead to disturbances in peroxisome assembly. It is also interesting and significant that mistargeting of protein is now thought to be another cause. It will be revealing to see whether mistargeting is the result of mutations in the genes encoding chaperones. The second part of the volume is concerned with the extracellular matrix. It sets out to show that a vast body of new knowledge of the extracellular matrix is available to us. Take for example the integrin family of cell adhesion receptors. It turns out that integrins play a key role not only in adhesion but also in coupling signals to the nucleus via the cytoskeleton. As for fibronectins, they seem to link the matrix with the cytoskeleton by interacting with integrins. Collagen molecules are dealt with in the last two chapters. The boundaries of collagen in disease are defined by drawing a clear line of demarcation between systemic connective tissue disorders (e.g., scleroderma), better known as autoimmune diseases, and the heritable, and the heritable diseases such as osteogenesis imperfect and the Marfan syndrome. This classification takes into account a second group of acquired disorders of collagen forming tissues in which regional fibrosis is the hallmark. Liver cirrhosis and pulmonary fibrosis are prime examples. The decision to place Volumes 2 and 3 before those dealing with cell chemistry was not easily made. It was based on the view that most students will have had an undergraduate course in biochemistry of cell biology or both courses, and that they could go to Volumes 4-7 in which the subject of cell chemistry is covered, and then return to Volumes 2 and 3.